In this lesson I’m going to focus on just one single verb, MAACHEN which literally means to do or to make BUT in combination with a noun it sometimes loses its literal meaning. 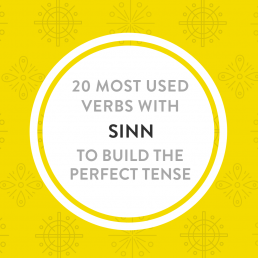 So, today, I’ll go through 10 common expressions with the verb MAACHEN. This is an irregular verb. You can check the conjugation on the Lëtzebuerger Online Dictionnaire. 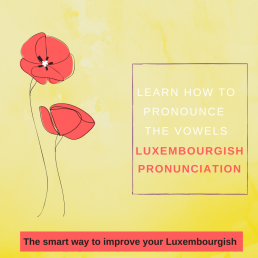 Learning words together – rather than individual words – helps you to sound more fluent and natural in Luxembourgish! Often, this is simply because you’ve used the wrong words in combination with each other. Take for example the word FRO (question), which is a noun. And there are a group of verbs that are often used with FRO: äntweren / beäntweren (to answer), stellen (to ask), hunn (have), sinn (be). Now, compare this to the verb, MAACHEN, which is not usually used with FRO. Often words go together like this, words frequently occur together in sentences. 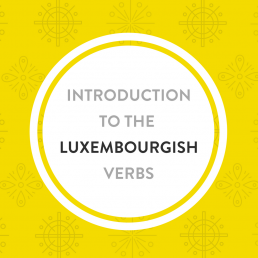 So start TODAY to use Luxembourgish expressions with the verb maachen so to sound more natural in conversation. Literally this would be to make celebration evening but this doesn’t make so much sense. Ech maachen haut schonn um 5 Auer Feierowend. Today I finish work already at 5pm. Ech ruffen nach engem Client un an da maachen ech Feierowend. I’ll call one last client and then I finish work. Ech maache mir Suergen ëm dech. I am worried about you (informal). Du brauchs dir keng Suergen ze maachen. You don’t need to worry (informal). Hie mécht mir Angscht. He scares me. Spanne maache mir keng Angscht. Spiders don’t scare me. Mat de Blummen méchs du him eng grouss Freed. The flowers will make her very happy. Wéi kann ech dir eng Freed maachen? How can I make you happy? An der Vakanz hu mir vill Fotoe gemaach. While on vacation, we took a lot of pictures. Kanns du eng Foto vun eis maachen? Can you take a picture of us? Oh … ech mengen ech hunn e Feeler gemaach. Oh … I think I’ve made a mistake. Ech hunn am Test vill Feeler gemaach. I’ve made a lot of mistakes in the test. Hie mécht sech Gedanken iwwert seng Zukunft. He gives his future some thought. Iwwert wat méchs du dir elo Gedanken? About what are you thinking now? D’Nopere maachen owes vill Kaméidi. The neighbours make a lot of noise in the evenings. Maacht manner Kaméidi, w.e.g.! Make less noise, please! Um wéi vill Auer méchs du deng Mëttespaus? At what time do you take your lunch break? Komm mir maachen elo eng kleng Paus. Let’s take a little break now. Meng Kanner maachen zweemol d’Woch Sport. My kids do twice a week sports. Méchs du gär Sport? Do you like doing sports? Learning words together like this in chunks, in common collocations, is a really good idea. You’re learning and practising a word along with the other words that it commonly appears with. Well, I really hope that this lesson helped you to see the value of learning words in chunks together to train your brain which words to use with other words. This type of study is crucial to training your brain to think in Luxembourgish instead of in your own language. It helps words come to your mind more quickly and efficiently without thinking about it too much, if you’re learning them together. Watch the video version on youtube so to practise your pronunciation and listening skills! And of course you can keep practising more with me!